Haven’t tried out the gratis version of the SPELL Tabs yet? Fill out the contact form with your company information, and you’ll receive the solution within 48 hours. When I started sharing samples from the SPELL program, last year, the most frequent question I got was: “How can I remove the link to Path to SharePoint from the tabs?”. That’s right, one of the tabs was a link to this blog (cf. above screenshot), a friendly reminder that I brought the solution to your home. Not so friendly as it turned out, as seeing that tab systematically in any tabbed interface was more than a user can bear. Lesson learned, when I released the gratis version 1.1 earlier this year, I made sure the Path to SharePoint link was removed. To date, more than 200 companies have adopted or are evaluating v1.1, and I am not getting questions about links anymore… here’s what I get now: “I don’t need the Show All (+), Hide All (-) and Full Screen ([ ]) controls, how can I remove them?”. First, let me explain the main reason why I added these controls in the first place: printing. Users sometimes like or need paper or pdf copies of the zone content. In such cases, they usually need to make all the Web Parts visible, and sometimes hide the rest of the page. In some cases, I have implemented custom interfaces where the user can pick which Web Parts he/she wants to print. Such implementations are usually combined with stylesheets that include media types. So think about it before deciding to remove the controls! How to modify or remove the controls? Last week, the Office 365 home page of one of my customers suddenly turned blank. In the past, my first reaction in this situation was to ask the user what they had changed, and fire the developer tools on IE or Chrome. I often work with power users, and as they say, they know enough about SharePoint to be dangerous! These days however, my first move is to check the Office 365 version number. In Office 365, Microsoft is now pushing minor updates on a regular basis, without your consent or even letting you know. Result: my customer’s Office 365 is different from my own Office 365, and also different from his neighbor’s Office 365. What happened in my customer’s case is that he was on version 16.0.0.3002 while I and others were still on version 16.0.0.12xx. The page went back to normal within 24 hours, so I guess there was a bug with the release and Microsoft fixed it. A similar case happened 3 months ago, when Marc Anderson reported on his blog a change in SharePoint pages that I couldn’t see. It turned out that here too the version he was using was different from mine. If you’d like to have that url handy on your site, simply add a link, for example in the quicklaunch, with /_vti_pvt/service.cnf as URL (no need to include your domain name). Side comment: I’d really like Microsoft to use us advisors, rather than the end users, as guinea pigs, and push Office 365 updates to us first! After the SPELL Tabs two weeks ago, I am now adding a Cascading Selects package to my Office 365 site. I already mentioned the Cascading Selects back in November. It was initially created for demo purposes, to showcase the capabilities of SPELL Form, a module designed to enhance SharePoint out of the box forms. In light of recent events (and in particular this update from the Microsoft Office team), I have repackaged it, and I am making a gratis version available to teams and small businesses. If you are interested, fill out the contact form with your company information, and you’ll receive both gratis versions – Tabs and Cascading Selects. These packages are end user solutions, and come with an “editor view” (cf. screenshot). The full versions are more sophisticated, with tools for power users and front end developers. SPELL works in SharePoint 2007, 2010, 2013, and Office 365 (version 16). If you are one of the 100 users who already registered their company to get the Tabs, the link to the Cascading Selects should already be in your mailbox! It’s that time of the year again when the unnatural becomes the norm, so let’s continue the tradition started last year with the SPELL program. 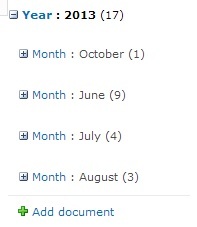 Our goal today will be to display list or library items grouped by month, as shown in the screenshot. The deal is that we don’t want any custom code or workflow here, just the regular out of the box UI features. 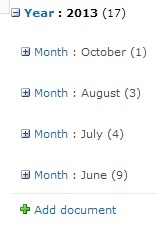 We’ll be creating two calculated columns, called Year and Month, where we’ll insert the appropriate formulas. I chose the “Modified” column for my sample formulas, but of course any other date column would work too. The result is less than satisfactory though (see screenshot), as the year is displayed with a thousands separator. and months are displayed as numbers. Still not happy with the result? Right, the months are displayed in alphabetical order, not sequential order, not yet an ideal experience for our end user. You can see the final result live on this page. If you want to get really fancy, you could even use the zero-width space character. The best part is that people who edit your formula won’t even understand the trick, as the zero-width space won’t be visible (there’s however a good chance that they break your cool formula). You can apply this trick to other situations. A typical example is a color code. The alphabetical order will give you Green-Red-Yellow or Amber-Green-Red, you can address that by adding the appropriate leading spaces. Be careful with this technique though: even if the rendering looks fine, the spaces are indeed stored in the field, and this might break other customizations. So this trick is better kept in a calculated column that will be exclusively used for rendering purposes. Five years after the first release, the HTML Calculated Column remains the most popular topic on this blog. The original page has been visited more than 200,000 times. It is definitely outdated, and in recent years I have pushed several new variations of this technique. 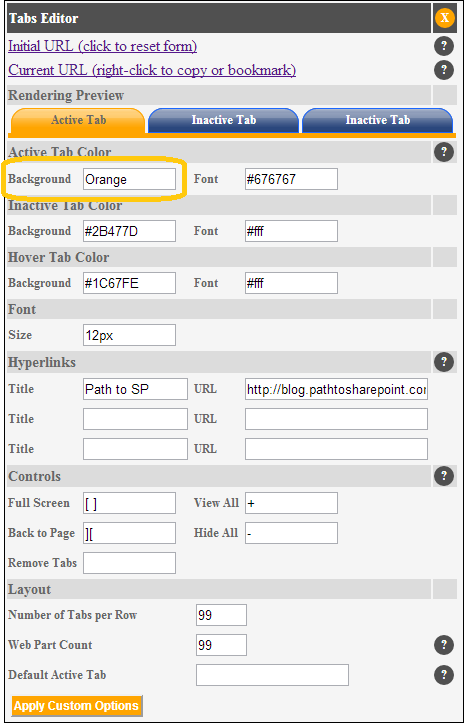 The most popular is the color coding solution posted in the SharePoint User Toolkit, backed by this tutorial. 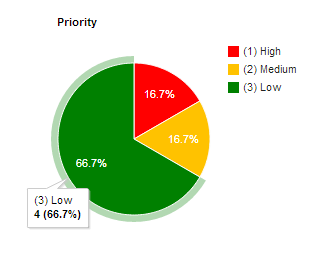 The most frequent issue reported by users has been the upgrade from SharePoint 2007 to SharePoint 2010. This is actually all taken care of in the above links… but you need to read the fine print. I plan to rewrite the instructions, especially as in the meantime Microsoft has pushed another version of SharePoint, and the SP 2010 update… doesn’t work with SP 2013! Well, there’s actually a simple fix for SP 2013, and “Panoone” posted it as a comment a couple days ago (@Panoone: thanks again! And let’s get in touch to discuss this further). But that’s not all. SP 2013 brings a bunch of new client side technologies, and one of them works very well in our case: Client-Side Rendering. 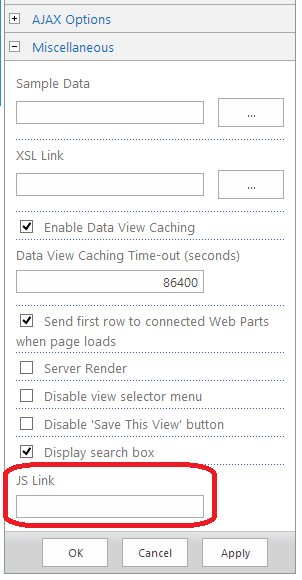 You can use Client-Side Rendering (CSR) in SharePoint to manipulate the rendering process of list views. Does this sound familiar? That’s exactly what my HTML Calculated Column has been doing for years! Except that now it is an official component integrated with list views. When you edit a Web Part, the very last option is the JS Link placeholder (see screenshot). It will certainly take several weeks before I find time to update the SharePoint User Toolkit, so for those of you who are already familiar with both CSR and the HTML Calculated Column, let me share the code for SP 2013. In the code, Calculated is the name of the calculated column. Of course, you could avoid using a calculated column, and build the html directly in the JS Link file. But then each rendering would require a different file. The beauty of the HTML Calculated Column is that one single JS Link file can support all the views in your site. 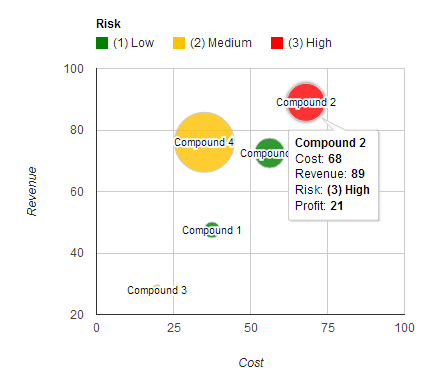 Some time ago, I wrote about security risks when you use the HTML Calculated Column. As far as I can tell, the same warning applies to Client-Side Rendering. Handle with care! When Microsoft released SharePoint 2013, the documentation on Client-Side Rendering was quite poor. Fortunately SharePoint bloggers stepped in and you can find some nice posts to get familiar with CSR. Wes Preston’s blog is an excellent start. So is the old way dead in SharePoint 2013? Not quite yet! Not every view accepts Client-Side Rendering, and for example you’ll still find my tutorial helpful for calendar views. This week, the SPELL framework is reaching version 1.0.0, and I am releasing the first component of this new version: the SPELL Tabs, successor of the Easy Tabs. SPELL is not just about new or upgraded scripts, it also introduces a new way for end users to manage their solutions. In the past, the advertised, end-user friendly way to include solutions in a page was to link to code through a Content Editor Web Part. This is still an option in SPELL, but the default method is now to use… a Page Viewer Web Part! This offers end users a no-code experience, where each solution behaves like an “app” and comes with its own, client side edit menu. The commercial version is distributed by User Managed Solutions LLC. SPELL is a tentacular program, so feel free to contact me with your questions or to schedule a call. For now, SPELL is still in “early adopter” mode, and the final blocks – shopping cart, forum, videos – will be added in the next 2 months (early adopters naturally benefit from an extended subscription period).